I’m very excited to share the Christmas tree that my sister Sarah and her family let me decorate at their house. My sis has a beautiful home filled with pretty shades of aqua and teal. For several years we have been trading pins and ideas for a fun Christmas tree for her house. When I saw the Martha Stewart Frosted Traditions Ornament Collection at Home Depot, I knew it would be perfect for my sister’s house! It’s full of vintage inspired designs in red, white and aqua. 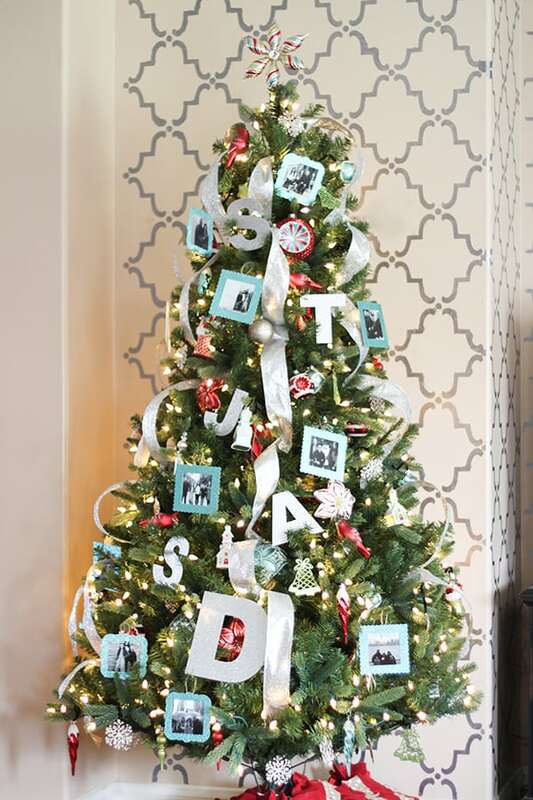 To personalize the tree for Sarah and her family, I made letters in her family’s initials and picture frame ornaments. I just love how it turned out, and most importantly, my sis and her family love it too! When the tree and ornaments arrived at Sarah’s house, neither one of us knew where to begin! Luckily, one of our friends is a fabulous Christmas tree decorator. Her top tips: decorate from the inside out and use black pipe cleaners instead of ornament hooks. Decorate from the inside out means start at the inside of the tree and fill in open spots with large ornaments. The 5 inch ornaments in the collection are huge and so pretty. They worked perfectly to fill in some of the big spaces! Instead of ornament hooks, our friend Morgan ran to the store and grabbed black piper cleaners. Then each ornament was securely twisted into place. It made it a lot easier to get the ornaments in just the right spot. 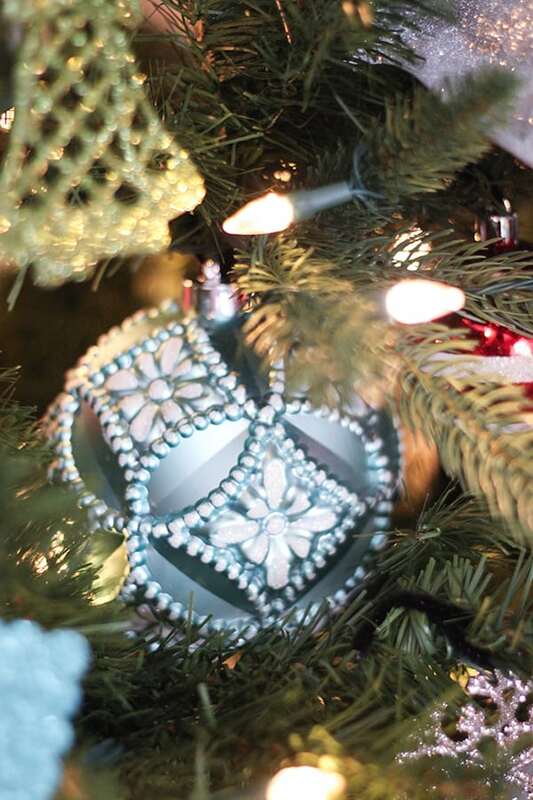 This ornament was one of our favorites! Along with these cute little church ornaments. To personalize the tree for Sarah and her family, I used my Cricut Explore to cut frames from glitter card stock. Then she printed off a few Instagram photos in black and white to have on the tree. I hot glued the edges of the pictures to the back of the frame and used a little jute twine to make the hanger. I love the look of typography on a Christmas tree, so I also cut their initials out of glitter card stock and tucked them in the tree. I really love this idea and plan to add it to our tree next year! Decorating a Christmas tree to photograph for the blog is intimidating, so I’m so thankful that our friend Morgan got us going on the right path! I can’t wait to try out some of these ideas on my tree next year! MSL Holiday Ornaments & Decor 9 ft. Indoor Pre-Lit LED Mount Everest Spruce Artificial Christmas Tree with Color Changing Lights Greens 7207015-P62HO This is the 9 foot tree, we used a 7.5 foot. Thank you to Martha Stewart Living and Home Depot for providing the tree and ornaments for this project! I was so excited to tell my sister we would be decorating a tree for her!